New Desktop Timer, Better Reporting and More! We’ve been busy! Give me a minute and I’ll show you what we’ve been up to. (Coming soon) An actual timer widget! Here’s a sneak peek of our new timer. We’re working hard to bring this to you as soon as possible. 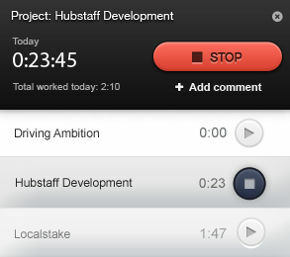 Hubstaff will still operate from the menu by default, but you’ll be able to toggle this brand new timer on and off. We’ve been using an early alpha version internally and don’t know how we lived without it! Get a work summary of what you and your team are working on delivered straight to your inbox each morning. Hubstaff intelligently sends you a work summary of your team if you manage one or sends you a personal work summary if you track your own time. Now you won’t have to login to the site to see how hard everyone is working! Want to make someone a manager of just one project? You can do that. Want to ensure that users of a project can’t see other users? You can do that. We’ve spent a lot of time thinking about and overhauling our roles. We’ve also added FAQs and explanations next to them so you can understand how to put them to good use. It’s now easier to track you and your team! We’ve broken time out into two tabs: “Me” and “Team”. So now it’s super easy to distinguish between the two. 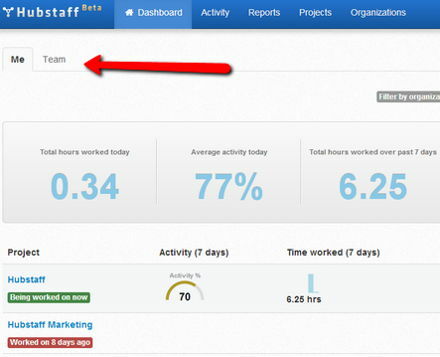 You’ll also be able to easily control which projects you want to log time to and which ones appear on your dashboard. We’ve got some other big features that we’re working on but we’re not ready to take the covers off them yet. As always, if you have any questions at all, please email me or reply to this email. Thank you for using Hubstaff! 1 Comment → New Desktop Timer, Better Reporting and More!